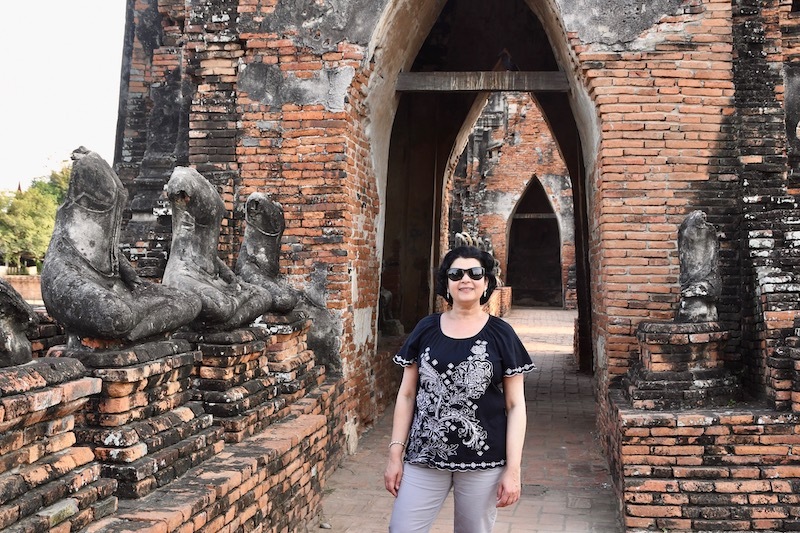 The ancient, historic town of Ayutthaya, situated about 85 km north of Bangkok, was once the magnificent capital of the great Thai empire that ruled over large areas of south-east Asia from the fourteenth to the eighteenth century. Named after the legendary city of Ayodhya in India, it reflects the seamless blending of Hindu and Buddhist cultures that is still found in Thailand. At the height of its powers, Ayutthaya ranked among the world’s greatest cities, with exquisite buildings and an elaborate grid of canals and roads. Visitors from China, India, Japan, Persia, the Arab world and Europe all came to marvel at the wonders of the city, to trade, or to study and worship in one of its many Buddhist monasteries. Ayutthaya was destroyed by a Burmese army that invaded in 1767 and burned to the ground. The survivors of the attack abandoned the city, and when they rebuilt their capital it was at the present site of Bangkok, whose official title still includes the name of Ayutthaya. The old palaces and temples were left to crumble neglected for over a century while the jungle grew back over them. Today Ayutthaya is one of the most popular tourist destinations in Thailand. The Ayutthaya Historical Park, located in the middle of the town, includes some of the most spectacular temples that have been carefully and painstakingly restored. Remains of other temples and monasteries are scattered all around the region and you can easily spend several days trying to visit all of them. Even if you do not have the time to do that, you must spend at least a day here to grasp the glory of the the ancient kingdom of Ayutthaya . On your way to Ayutthaya you will pass by a touristy, bustling floating market which will provide you with a completely novel shopping experience! If you’re based in Bangkok, there are several authentic floating markets such as Damnoen Saduak, that are within easy traveling distance. It is real fun to cruise along the narrow canals, absorbing the sights, stopping occasionally to sample the wares on offer. Here you will find sellers in boats peddling everything from trinkets and souvenirs to fresh fruit, made to order hot food and even coconut ice cream with all the fixings! Stir fried noodles are my favourite and I made sure to have some wherever we went. By far, the most fascinating noodles were the ones that were being cooked on boats in the floating markets. To watch these amazing cooks deftly prepare food in the tiny confines of a rocking boat was an experience in itself, but to savour it while gently floating by in our own boat made it that much more memorable. You can skip the shrimp, eggs and fish sauce and make these noodles vegetarian if desired, and also add other vegetables such as thinly sliced cabbage or green beans. If you can find smoked tofu, use that for the wonderful smoky flavour it adds. These noodles are best eaten fresh out of the pan, so have all the ingredients prepped (as they do on the boats!) and stir fry them just before serving. 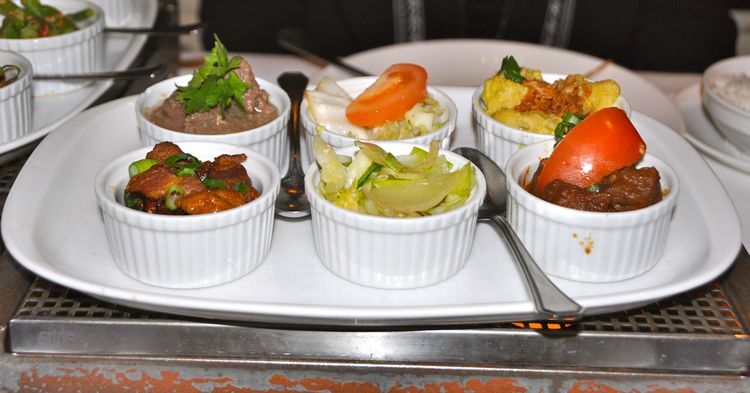 For more easy and delicious Thai recipes, check out Thai Green Curry Chicken, Red Curry Fish or Mussaman Potato Curry. Bring a large pot of water to boil over high heat. Add noodles and switch off the heat. Soak noodles in boiling water until softened, stirring now and then to loosen them, about 3-4 min. Drain and set aside. In a small bowl, combine soy sauce, tamarind sauce or chutney, tomato ketchup, lime juice, hot sauce and fish sauce. Set aside. Pat shrimp dry and lightly dust with salt. Warm 1 tbsp oil in small frying pan over medium high heat. Pour eggs in, make omelet. Shred omelet roughly with spatula. Set aside. Warm 1 tbsp oil in same frying pan over medium high heat and gently saute the shrimp for 2 min until they are lightly pink and almost cooked. Transfer to a plate and reserve for later use in the recipe. Wipe down skillet and warm remaining 2 tbsp oil in it over medium high heat. Add the onions, garlic and red pepper. Sauté 4-5 min until lightly browned. Add tofu cubes, reserved noodles and reserved soy sauce mixture. Mix well, cook 2 min. Note: Just before adding noodles to skillet, loosen them under running water if they are sticking to each other. Add reserved shredded omelette, shrimp, bean sprouts, green onions and 2 tbsp of the roasted crushed peanuts (reserve remainder for garnish). Stir fry gently, tossing with 2 forks until everything is well mixed, about 2-3 min. Transfer to a platter and garnish with peanuts and lime wedges if desired. Our first impression of Bangkok was one of chaos, as we tried to battle our way through the throngs of people everywhere, the gridlocked traffic, and the street stalls that crowd the sidewalks. Then, after a day or two, we began to feel the rhythms of the city. Behind the tumult of the streets there are oases of calm - gardens and temples of stunning beauty. The people are always quick with a smile and gracious with their warm hospitality. 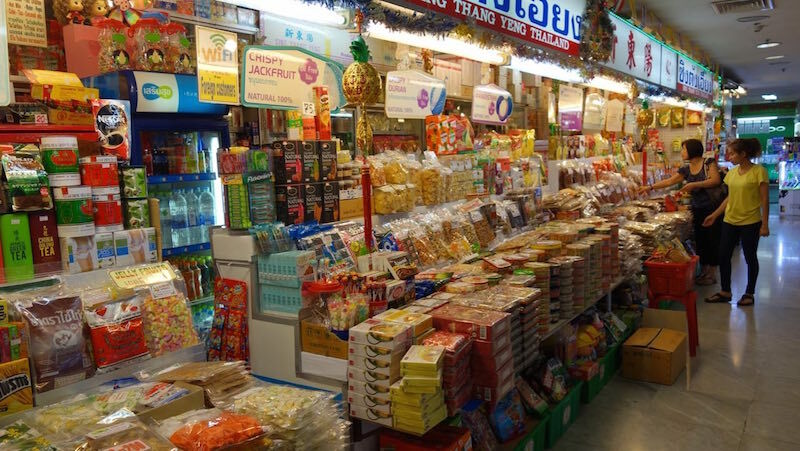 The stalls that make walking through the streets such an obstacle course are the real treasures of the city, for Bangkok is, above all, a never-ending feast! Bangkok is probably one of the best and safest places to eat street food. Not only is it fresh, delicious and reasonably hygienic (well, we never once fell sick! 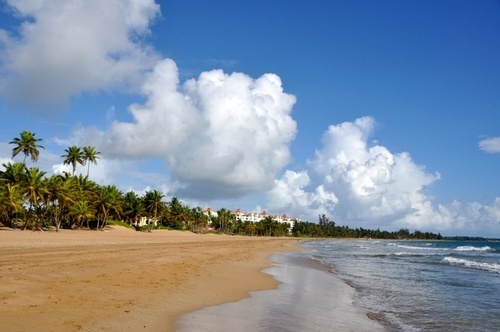 ), it is also cheap, plentiful and very popular with locals and visitors alike. Judging by the sheer number of vendors who have set up impromptu food stalls on every street and their immense popularity, no one in Bangkok seems to cook at home! There is something very satisfying about watching your meal cooked right in front of you while inhaling all those heavenly aromas. Just like being in a cooking class! While Pad Thai noodles, grilled chicken satays and fresh seafood were some of our choice things to eat from street food vendors; whole grilled fish, coated in a thick 'plaster' of salt and flour was easily our most favourite. The plaster hardens as it dries and keeps the fish incredibly flavourful and moist inside. Before being coated with the flour and salt paste, the fish is first stuffed with lemongrass and herbs to add more flavour. Served with a garlicky dipping sauce, liberally spiked with fiery Thai chillies, it was an amazing new dish that we encountered. Literally every street in Bangkok has some amazing food and it is very tempting to just follow your nose to the nearest food vendor, grab a stool and eat what's offered. Sukhumvit Soi 38, was one of the first places we ventured out to try street food. One of Bangkok's most popular street food havens, it is lined with lots of food stalls, plastic tables and chairs and exciting Thai food of every description. We grabbed ourselves a couple of plastic chairs and soon an adorable little urchin was at our elbow, offering us a bunch of menus from nearby vendors. This little guy cheerfully helped us choose the foods that we would like, brought our meal to the table and was thrilled to pose for a photograph! 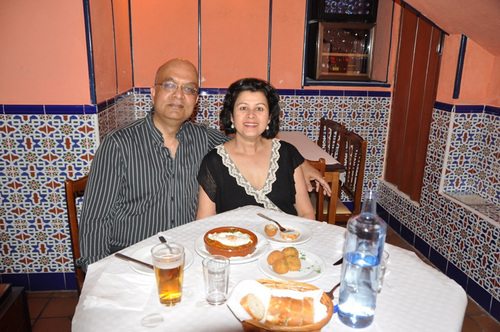 The food was cheap, tasty and fresh - an unbeatable combination! We washed it all down with chilled green coconut water and felt well fortified to explore some of Bangkok's famous nightlife. One of the joys of being in Bangkok was that I could have my favourite Pad Thai noodles for practically every meal! We had it in fancy restaurants where it came wrapped in a gossamer thin, lacy omelette and we had it by the side of a street, sitting on a plastic chair while watching the food vendor deftly toss the ingredients together in a huge wok. No matter where we ate it, or how often, it was always fantastic! My recipe here is vegetarian but you can easily add sautéed shrimp or chicken if you wish. This is probably very unorthodox of me, but I like to add in some rich coconut cream (skimmed off the top of a can of coconut milk) for the extra creaminess and flavour it adds to the dish. For even more flavour, add a teaspoonful of Thai curry powder and serve with Thai chicken satays or Mussaman Potato Curry to round out the meal. Soak noodles in enough hot water to cover for 20 minutes or until softened, stirring now and then to loosen them. Drain and set aside. In a small mixing bowl, combine the tamarind sauce, ketchup, lime juice, coconut cream, curry paste or chilli sauce and soy sauce. Set aside. Beat eggs in a small bowl. Warm 1 tbsp oil in small frying pan over medium high heat. Pour eggs in, make omelet. Shred omelet roughly with spatula. Set aside. Warm remaining oil in large non-stick wok or skillet over medium high heat. Add the onions, garlic and red pepper. Sauté 4-5 min until lightly browned. Add the bean sprouts, noodles, egg, tamarind soy mixture and peanuts. Stir fry gently, tossing with 2 forks until everything is well mixed, about 2 min. Transfer to a platter and garnish with chopped coriander, green onions and extra peanuts and lime wedges if desired. A trip to Bangkok has long been on our wish list, so we were thrilled to be able to spend a few days in the city recently. Thais are the friendliest people on earth and we felt welcome as soon as we got there. Throw in some amazing food, great shopping, historical sights as well as gorgeous temples and we were ready to move there permanently! One of the first places we wanted to see in Bangkok was the Grand Palace complex. Even after reading and hearing so much about it, we were completely dazzled by its beauty and sheer magnificence. The walls are decorated with an inlay work of semi precious stones while golden domes, gilt edged pillars and life sized golden statues add to the grandeur of the place. One of the city's most well known landmarks, this huge complex was the home of the king and his court as well the place of government for more than 150 years. Within this sprawling complex is also the temple of the Emerald Buddha, a must see sight for any visitor. Buddhism is an integral part of everyday life in Bangkok. You can pay homage to the Buddha in many of the fabulous temples that dot the city. The most famous of these are Wat Pho with its magnificent, giant statue of the Reclining Buddha, Wat Mahathat, one of the oldest temples in Bangkok and a centre for learning meditation, Wat Phra Kaew or the temple of the Emerald Buddha and the spectacular Wat Arun or the temple of the dawn, built right on the river front. A lot of the temples, palace complex and other places to see lie along the banks of the Chao Phraya river. A good way to avoid Bangkok's chaotic traffic is to hop aboard a boat, especially in the evening when you can relax in the cool breeze and watch the twinkling lights of the shore. This is still very much a working river and you will see cargo barges sailing amidst river taxis and tourist boats, adding to the bustling atmosphere. A fun place to stop off on your boat excursion is Asiatique. This huge open air night market is filled with shops, restaurants, street food vendors, entertainment and lots of excitement! We found it to be the perfect place to buy souvenirs and gifts. The food in Bangkok is waaay better than anything you can imagine! From higher end restaurants such as Baan Khanitha to lowly street food carts, it is all prepared with fresh ingredients, aromatic herbs and lemongrass, with the perfect balance of sweet, sour, spicy and salty. I just couldn't get enough of my favourites such as Pad Thai noodles, papaya salad and green curry or guzzle down buckets of rich Thai iced coffee sweetened with condensed milk! The word "Mussaman" derives from "Mussalman", the Hindi word for Muslim. 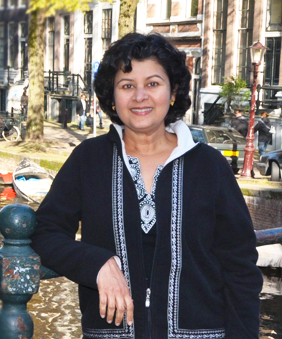 Indian sailors and traders, many from Gujarat, have been frequent visitors in Thailand, Malaysia, and Indonesia for over a thousand years, and their cooking techniques have left a long-lasting impression on local cuisines. Mussaman curries are a magical blend of Indian curry spices such as cardamom, cinnamon, cloves and black pepper with Thai ingredients such as lemongrass, galangal and fish sauce. We first had this fantastic potato Mussaman curry at the hotel we were staying at in Bangkok. Called AriasomVilla, it is a lovely, charming, green oasis in the middle of a bustling city. 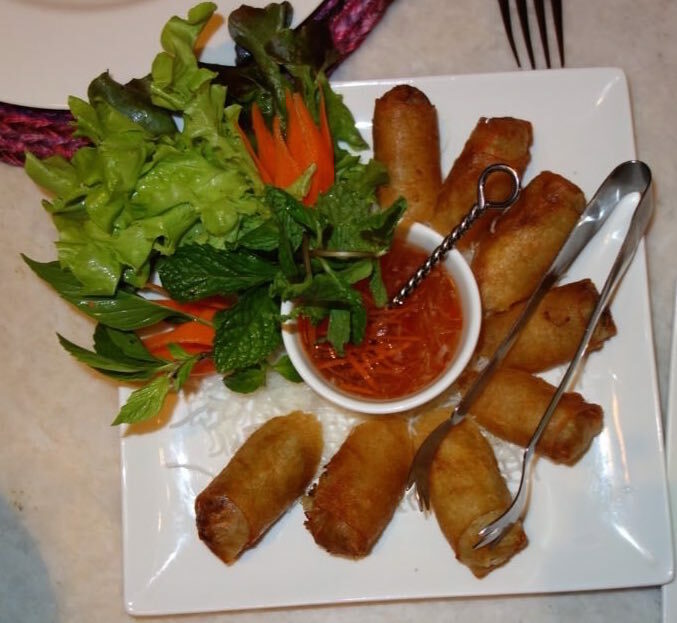 It's restaurant Na Aroon is vegetarian with many delicious, authentic Thai dishes on the menu created by chef David Lees. My recipe is based on one generously shared by Chef David, with a few minor changes here and there (with apologies to chef David!). The restaurant uses vegetarian 'chicken', which I have omitted from the recipe, instead adding tomatoes and herbs for colour and flavour. For variety, add small cubes of tofu or paneer and some green peas along with the potatoes. This curry goes best with plain steamed rice or with warm naan to scoop up the delicious sauce. And the best part is that it tastes even better the next day! 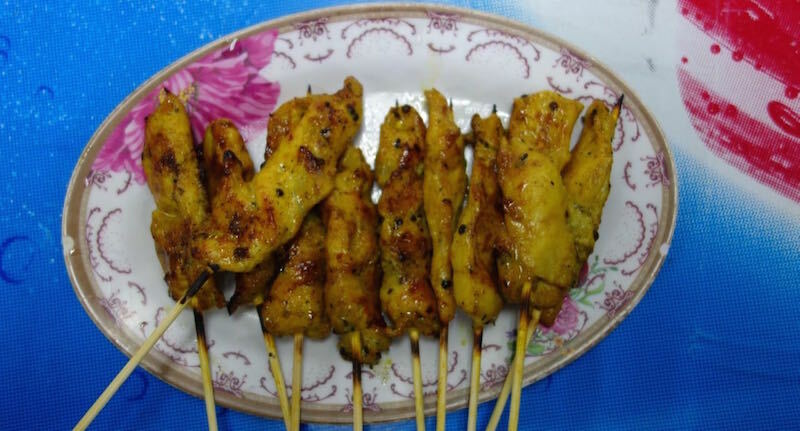 If you would like to serve this dish with chicken satay skewers, click here for the recipe. Bring a pot of water to a boil, add potatoes and cook them until just tender but not mushy or falling apart - about 12 - 15 min. Cool, peel and halve them. Reserve. Meanwhile, warm oil in skillet over medium heat. Add onions, garlic, ginger or galangal, lemongrass and peanuts. Sauté until lightly browned and softened, about 5-7 min. Cool slightly (about 5 min), then transfer to the jar of a blender, along with the coconut milk, curry powder, sugar, fish sauce (or salt to taste) and water. Blend to a smooth paste. Transfer this paste back into the skillet, set over medium heat. Add reserved potatoes, stir to mix, cover skillet and cook until mixture starts to bubble. Reduce heat to low and cook for 15 min. or until potatoes are very soft and sauce is thick. Stir occasionally. Fold in tomatoes, lime juice and fresh herbs. Cover and let curry rest 5 min. before serving.